Download, print, study, rehearse, perform, enjoy! If you download, please tell me. Don't want to do it youself? Purchase printed scores & parts from Frog Peak Music. Report the performance to me & ASCAP (One Lincoln Plaza, New York, NY 10023 US, Attn: Indexing). Used it for teaching? Please tell me what your students thought. Send a recording if you made one to Dennis Báthory-Kitsz, 176 Cox Brook Road, Northfield VT 05663 US, or upload it. I even enjoy amateur or 'living room' performances. Don't be shy! Do not republish my music without written permission from me. This music is not public domain. The usual rules of copyright apply. Why are my scores free? Looking for parts? This link is the index of all score downloads, including music not yet listed here. Find manuscript scores described in the Big List. Ask me for photocopies. Want scores or parts you don't see? Is the music not arranged for your ensemble? Ask me. I can make arrangements or grant you permission to do so. to download a performance in MP3. to listen to an MP3 demo performance of an acoustic piece. to watch a RealMedia video of the music. to watch a Windows Media video of the music. to watch a video of the music on YouTube. to read program or lecture notes in DOC format. Available from Frog Peak Music means printed editions can be purchased. [OK for broadcast] means broadcast rights are granted. At left full scores versions 0, 1, 2 and 3; respective parts in the column below. (Version 3 parts are labeled version 2, except for addition of saxes). Above playback is version 3. The Concerto was an enormous virtuoso piece, particularly for the brass, written as two choirs of instruments and two soloists. The first movement is through-composed, the second with sections chosen at random. Score and parts currently available in manuscript only. Please use the contact form for copies. As simple as it gets for a junior high school band ... except the fact that it's in 5/4. Fun to do. Please use the contact form for copies of the parts. 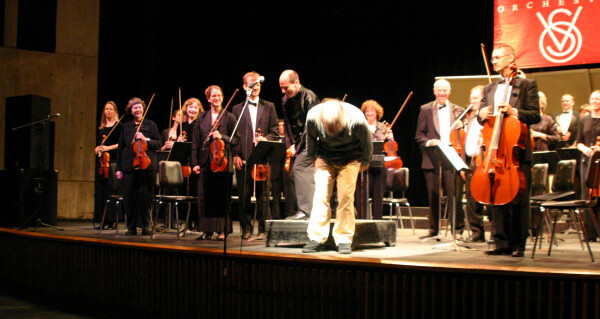 The composer takes a bow and nearly launches off the stage at the tour performance of "Icecut". Using the early American tune as its reference, A Fanfare for Peace was written at the advent of the Gulf War. Its brief cry ends in an exultation. It was commissioned by the Vermont Philharmonic Orchestra. Score and parts currently available in manuscript only. Please use the contact form for copies. The Liniment was written for La Vendetta, a play by David Gunn. Its bitonal jolliness incorporates snippets of Bolero and lots of loud brass tunes & percussion. Score and parts currently available in manuscript only. Please use the contact form for copies. Mantra Canon is a massive high-minimalist work full of surprises (including definitely non-minimalist fugues and bitonality). Its non-stop pulsing and solfège chorus drive ceaselessly for a half hour. One performer at the premiere called it "Shogun in music". This is a demanding work for all. Score and parts currently available in manuscript only. Note the PDF above is the manuscript and is very large. Please use the contact form for copies. Here is the premiere performance, one on a part. T. L. Read conducts "Mantra Canon" with the UVM Symphony, 1988. Full score printable in tabloid size (PDF). This march was created for my absence during two consecutive Kalvos & Damian shows in March of 1996 -- hence the title. It's a tricky piece that's a lot of fun -- like all my marches, for who could write a serious march these days? Please use the contact form for copies of the parts. Set of parts in Finale ETF format. Created for the Vermont Alliance of Independent Country Stores, a very traditional, tonal film underscore that can be played as a suite. A tight ensemble of 2 horns, trumpet, English horn, percussion, strings, guitar, and banjo. Please use the contact form for copies of the parts. Complex isorhythmic fanfare created for the 25th anniversary of the Friends of Music at Guilford (Vermont), which also hosts the Yellow Barn Festival. There's a series of tragicomic stories about the premiere of Yçuré in the MP3 to the left. Suffice it to say that this piece is difficult and deserves one really fine performance. Score and parts currently available in manuscript only. Please use the contact form for copies. "In case you've not heard Dennis Bathory-Kitsz's music - he's on soundcloud now. I know that the relentlessly hip claim that there's no real composers anymore and that everything written large is for movies or commercials - but this fellow is a living composer that does a wide range of excellent work. Take a bit of time to check out what he does and reassure yourself that art is alive." "Dennis Bathory-Kitsz is an eclectic listening station all by himself!" "Wow. Here is a wildly eclectic, erratic, difficult, staggeringly prolific contemporary composer with 500 pieces to his name. His music ranges from medieval-influenced brass quintets to elaborately staged Avant-Garde multimedia experiences. One piece is exclusively performed by an army of forty car and truck horns honking away to a score on a flatbed truck! Bathory-Kitsz also writes in a more identifiably modernist classical vein, with harp duets, oboe solos, and choral passages. Some pieces incorporate drone with classical counterpoint techniques. He's written a suite for quarter-tone violin; it sounds almost like a Western scale, but ever so different...and eerie. He's even written a chamber opera, whose regular, pounding drumbeats and choral passages evoke a witches' sabbat. Finally, he has written some works for electronic instruments, which in their repetition of vocal snippets, percussive noises, and electronic drone recall early Steve Reich. Bathory-Kitsz's music encompasses the entire European classical tradition in its scope; it's well worth the listen." Air: "I think that is a particularly wonderful piece. I like every second of it, and I do not at all mind the repetitions. These are not gratuitous repetitions. Air is a most inspired, imaginative, successful piece. All kinds of wonders unfold all the time, from start to finish. It's my favorite new piece of yours." Ave Verum Corpus: "It's a work of great beauty. It's moving and it's wonderful. Very beautiful, plus an entire course in voice-leading and harmony could be taught from this piece, and I would be happy to teach that course. Most of all, it's wonderful to hear (and certainly a pleasure for them to perform, too)." bellyloops: "According to my personal interpretation, this is a 'field recording' of someone being chased by a chupacabra. Just when he thinks he has lost the monster and everything will be okay, it reappears suddenly and pounces and...the rest is pretty grisly, so I will leave it up to your imagination (as does the composer)." Brand 9 From Outer Space: "Journey to this fellow's page, and you'll find --among much else, a lot of it very tasty-- a couple of car horn symphonies, which (if I'm reading the notes correctly) were performed and conducted in a parking lot in Trenton, New Jersey, with an orchestraconsisting of... parked cars. THIS piece isn't like that. But it's real good anyway, despite the fact that the musicians are all playing actual musical instruments. And if you'd like to play along, there's a link that will allow you to download the score." Car Horn Symphony No. 1: "beep beep beep. you CAN make music out of ANYTHING, anywhere." Car Horn Symphony No. 2: "I own a CD featuring a Car Horn Organ. This is not that, not even similar in fact, but the point is that yes, car horns make perfectly good musical instruments. The evidence accumulates, in spite of the not entirely pleasant circumstances under which we often hear them. Dennis says he had a lot of fun writing this. It sounds like the players and conductor had a lot of fun. Now the only missing ingredient is YOU. Listen and I think you will have fun, too!" Crosscut: "Crosscut is a 20-minute concerto for piano and winds with a gratifying shape: the three movements are loud/soft/loud, but contain enough recurring figures to suggest the sense of a one-movement work. Once again, the piece starts off with rather minimalist repeated chords and arpeggios, but becomes so rhythmically complex in the piano and dissonant in the brass as to gradually give a more muscular impression. Then, after an abrupt cutoff comes an almost stationary slow movement with a couple of rhythmically complex figures that keep recurring every few measures. The unity they produce is remarkable, though the repetitions are too complex to become predictable. The third movement smoothly quotes material from both its predecessors. If Bathory-Kitsz’s style varies considerably from work to work, each movement is always unified by a clear concept.". Detritus of Mating: "Adding to the [Pavel Kraus at Bond Gallery] show's ambience was a sound component, an almost ecclesiastical compositon with several movements of altered voices by new-music composer and frequent Kraus collaborator Dennis Bathory-Kitsz"
"At the deepest level this music lulls and intrigues, irritates and begs your answers. Ambient for sure ... further than that, always. Growing and moving, wiggling in your ears, this sound creates a basket of safety and insecurity. Knowledge of gods and goddesses way back coming through present life." "Those addicted to the new-music radio show and Web site Bathory-Kitsz cohosts will find interest in his sound sculpture, a sample of which is caught here. Glistening tones ring in the air, bits of deconstructed voices float by, a dark bass pulse starts up that's more felt than heard, in large-scale periodic cycles that would replicate the opening if allowed to continue for some 27 years. You don't get a distinct idea of his creative personality from this first disc, but it's enjoyable how the exquisite rings continually modulate even when nothing seems to be happening." "There is an ethereal quality to the accompaniment resulting in an effect that is indeed surreal. But, rather than atmospheric, the work is made of clearly delineated lines that, with the work's tightly knit rhythms, lead it to a dramatic climax and coda. The new work proved difficult listening..., but ultimately fascinating." "What can I say but nice music!" Erzsébet: "A powerful new one-woman opera... The overall effect was powerful, due in large part to the evocative music. The soprano vocal line ranged from lyrical to edgy to forcefully spoken. This was accompanied by a score that ranged from Medieval and Renaissance styles to Hungarian folk melodies to uncomfortable edgy atonal atmospheric moments, all woven itno a very effective whole. The production was sophisticated and elegant." "It sounds terrific: colorful, mysterious, and very operatic." L'Estampie du Chevalier: "Bathory-Kitsz can also exhibit intense single-mindedness. One of my favorite of his works is his third string quartet titled L’Estampie du Chevalier (2005), a breezy essay in endless melody. Two of the strings (and which two they are keeps changing) are always playing a duo melody in ever-changing note values with insouciant disregard for the bar line, while the other two appear and disappear, punctuating or filling in with running eighth notes or pizzicato double-stops. It’s a single thirteen-minute idea played out with very little change yet continually self-renewing variety, one of the most unified quartet movements you’ll ever hear." Eventide: "Perhaps the most colorful use of the instruments was by ... composer Dennis B&aathory-Kitsz ... the three pieces form his eight-part "Eventide" employed piccolo, small clarinet and contrabassoon. The composer explored the contrasting sounds emanating from this unusual combination in a surprisingly consonant and attractive way. The moods ranged from hauntingly beautiful to exciting." Fanfare:Heat: "Bathory-Kitsz's "Fanfare: Heat," written for the VYO, was also complex. At some 11 minutes long, it's a short work but a lot happens. Opening brilliantly, it begins a journey, first a turgid one, then a more joyful one, building all the time to a brilliant finale. The harmonic language and rhythms were spicy and occasionally jarring, but Peters and his young players managed them with feeling. It was quite exciting." For Fog is the Promise of Cloud: "It's very beautiful. There's a wonderful sense of acceptance at the end, and i would not have been surprised if that had not happened, although it's encouraging (and beautiful) that it does move to that resolution. I often think 'glacial' in connection with your music, but I don't mean cold. I mean massive, like sculpture. Worldly and other-worldly too. That is, of this world and also of another (hypothetical) world. This piece has quite an overt schizophrenic aesthetic, simultaneously aligning contrasting kinds of musical gestures." Fuliginous Quadrant: "Fuliginous Quadrant for violin, cello, clarinet, and piano is written almost entirely in the A-harmonic-minor scale, yet every one of its texturally varied phrases cadences on a high F in the violin, which really messes with your large-scale perception of the tonality." I think of thee! : "It’s most unusual, when there is music by justly famous composers on a program, that the highlight of a concert is a new work by a local composer. But that’s just what happened at Friday’s Vermont Virtuosi concert, “Poetic License,” at Montpelier’s Bethany Church. Northfield composer Dennis Báthory-Kitsz’s “I Think of Thee!” which received its premiere, proved a beautiful and powerful experience. Báthory-Kitsz set the Elizabeth Barrett Browning poem, from “Songs of the Portuguese XXIX,” unusually for soprano, bass flute and guitar, hence a truly exotic feel. More importantly, the work exudes the rich depth of emotion of the poem. Soprano Gail Whitehouse delivered the simple lyrical melody line with a quietly nuanced expressiveness. Underscoring that line was the soft bassoon-like warmth of Laurel Ann Maurer’s bass flute and the driving punctuation of Peter Matthews’ guitar. What made this largely tonal song riveting were the richly undulating sounds of the bass flute and guitar behind the haunting but inviting vocal line." Your song is a beauty! I like everything about it, like the melody, harmony, florid rhythms (how masterfully you do that), and the exceptional degree of independence between the parts. Icecut: "He was full of energy and excitement, which would be a good way to describe his piece "Icecut," too. The music had some demanding string writing, which the players handled like a shortstop making a tough play look easy. I was really thrilled to hear such high quality music." "It was Bathory-Kitsz's 10-minute work, commissioned by the VSO, that proved most striking. Beginning with a darkly driving force of strings, the brass introduces a haunting melody, then taken up by the strings; the strings subside, becoming a restless bed for the exuberant brass; the cellos take over, receding to a quiet but relentless agitation so a gentle woodwind melody can be heard above; the violins take over with cellos and basses continuing to provide a driving rhythm; all builds to a grand moment – then subsides and fades out. ... The work proved compelling, and its nature could easily have been inspired by Vermont's difficult winters. The work is largely tonal and accessible despite some intricate writing. But most important, its driving force – loud or quiet – compels the listener to go along for the ride, a quite exciting one." "A masterpiece worthy of Stravinsky." Broadcast January 17, 2001, on Dutch Radio 4 Live, "A New Stage"
"A fascinating and earthy work ... its quiet drive and gentle rhythm seduced the listener into an almost primal state. Báthory-Kitsz continues to be one of the state's most fascinating and sophisticated composers." "This is an A-1 Blue-ribbon piece of music. Download it!" LiquidBirds: "LiquidBirds proved beautiful in its sound and sound movement. ... This work, like most of the composer's, had the feel of form, and gave the listener something to hold onto. The result was beautiful music." LowBirds: "Wind and piano gestures flit through this 'mysterious soundscape.'" Meta-Dream Twice: "Although a knotty work, its linear simplicty and straightforward nature made it attractive and rewarding." Mirrored Birds: "It would be possible for a 30-minute piece that lacks the formal trappings of melodic development (or even much melody at all) to be, well, boring. But [the composer's] 'Mirrored Birds' didn't strike us that way at all. ... the horns and especially the timpani were extremely busy (in a quiet way) ... the flute solo was a virtual sonic aviary of birdcall." Mountain Dawn Fanfare: "Start your day the mountain way, with this serene fanfare for winds." No Money (Lullaby for Bill): "A symphonic piece made entirely out of a speech by bill gates by a very talented composer." "En perle fra øresneglen! Marvellous collaboration & a masterpiece!" "The VCME premiered one of its own commissions, 'O Vox Pop,' a spicy confection by Northfield composer Dennis Báthory-Kitsz. Klimowski on bass clarinet and Elliott on bassoon enjoyed the wonderful colors of the lyrical first part, as well as the light chase of the second. It was more than fun it was expertly written." "Largely uncharacteristic of the skillful composer, best know for his well-crafted but complex and difficult music, the two-movemente work ... was lovely and lyrical -- but, of course, not all that simple." "Sublimely beautiful is the only way to describe Sourian Slide for strings ... also heard for the first time ... it builds quietly and achieves a quiet but powerful drama with ne'er a loud note. Pretty tonal for Bathory-Kitsz, who frequently writes difficult and cutting-edge music, Sourian Slide is splendidly written." Starry Night "Another big success was the premiere of Northfield composer Dennis Báthory-Kitsz’s hauntingly beautiful 2007 “Starry Night.” The atmospheric work opens with dark bass notes setting the scene, with “stars” appearing and “sparkling”, asymmetrically working their way through the night. Pepper showed real sensitivity toward this short but attractive work, using excellent tonal control descriptively. Teething Rings: "A room full of screaming babies and a nanny with not enough teething rings to go around. An avant-garde 'classic' in the fluxus tradition." A Time Machine: "[The] composer went for broke with [the] ambitious work for nine musicians that alternates sung verse with orchestral improv, ancient sounds and avant-garde ones."